My husband purchased a time share before we were married. My husband is very "frugal" so when I found this out I was shocked and excited. We have been going to Star Island every other year for 14 years now. I love it. I have loved it from the very beginning and it feels like a second home to me. It is located right outside of Orlando. My girls love going to Florida. With the horrid winter we have had here in Michigan, I could not wait for my warm weather getaway. We have been to Disney World more times than I can count. I let each girl choose one park, Matt and I have a spa day, and the rest of the time I usually lay at the pool and sip fruity drinks. We ended up choosing to go to Islands of Adventure first. Which is a Universal Studios park. When we arrived they gave us a fabulous deal. The 4 of us, 3 days at the parks for under $700 dollars. Usually for the 4 of us for 1 day at Disney is over $400. So, score! We decided to arrive when the park opened. I had never been on a Sunday before, but I realized it wasn't packed as bad as I thought it would be. We headed immediately to check out the Harry Potter section. The girls proceeded to pick out their perfect wands. 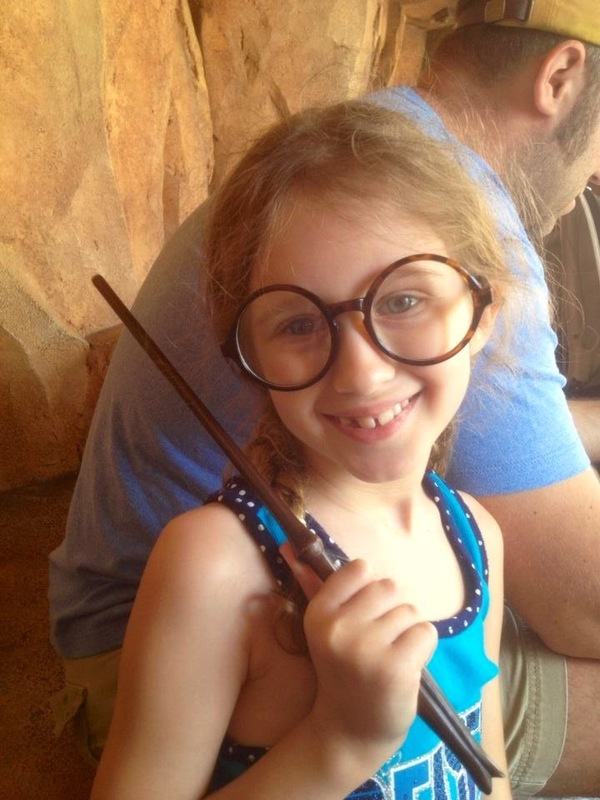 Keira (picture above) also had to get the Harry Potter glasses. I'm not a huge Harry Potter fan, but I enjoyed the area and the special effects. Faith loved the butter beer. I really liked it also. It tasted like a foamy mix of root beer and cream soda, but more on the cream soda end. Keira hated the rides. The only thing we managed to get her on were a few rides in the Dr. Suess area. So, her and I did a ton of shopping and visited with characters. My favorite part of our first day at the parks was having lunch at Mythos. Mythos has been the number one theme park restaurant for many years. The food was priced to make me happy and it was delicious. In fact, I loved the Universal pricing at just about all of the restaurants. The pricing was like an Applebees, but the taste was fabulous. It made it so much nicer being able to sit down for a good meal every afternoon. Disney is crazy when it comes to their sit down restaurants and the food isn't that great. When it comes to keeping kids entertained, that don't like big rides, Universal Studio does a great job keeping them entertained. There were tons of Universal characters walking around at all times. My daughter and I sat where all of the parade shows were and saw most of them. She was even invited to dance with Gru and the minions. She is shy, so she declined. She was so excited to get her pictures with the characters my phone died after awhile. I felt bad because she wanted a picture with Gru's daughters, and they were so cute! Out of all of the rides, I would have to say my favorite is the Incrediable Hulk roller coaster. Yes, the Harry Potter Forbidden Journey was pretty cool, but to be honest I'm getting old. The 3-D and 4-D now makes me nauseous. The coasters make me sick now, but I'm still going to ride them. Check out my favorite ride below. Faith and Matt agreed on their favorite. I didn't get to ride it because I had Keira with me. They loved the Transformers ride. Here it is. Which brings me to another point. The child swap at Universal is brilliant. One parent stays with the child while the other rides, and then the other parents swaps and hops on. If you child is tall enough to ride the ride they can stay alone is this little holding room. Seriously, great idea! The last day we were so sick of the lines. In two days we each rode about 5 or 6 rides, total! Keira was exhausted and decided to stay with my parents. So, we decided to get the VIP pass. The VIP pass is $75 per person and allows you to skip the lines. It's a rip off, yes, but totally worth it. We finally were able to ride everything. The wait time went down from hours to just minutes. Loved it! Since my parents were with us we decided to have a date night. I love eating out. It's my thing. I got online to find the top 10 ten restaurants in the Orlando area. 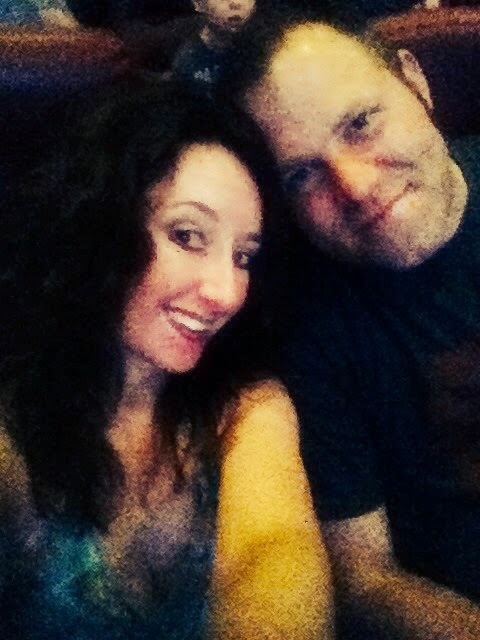 In the mean time, my husband was driving me nutty to go see Captain America. I found that the AMC 20 in Downtown Disney was voted one of the top 10 places to eat. I was totally excited to try eating while I was watching a movie. Here is a picture. So did it live up to my culinary delight? Nope, it sure didn't. It was not easy to see and shovel food in my mouth. The food tasted like bar food. It didn't live up to my expectations. I give it that it was cool to try at least once. The rest of the trip we spent either shopping or relaxing at the pool. I treasure these special moments that I have with my family. My kids are growing up so fast.